His leaving the Orthodox Church followed by his proselytizing led to great unrest, rioting, and his eventual bloody murder by an axe that split his head. Far from being, as the article heading states, "St. Josaphat’s quest for unity between Catholic, Orthodox Churches continues," his efforts to push the Union of Brest to tear Orthodox from their Church and into union with Rome did great harm both in its leading to apostasy and Latinizations. Vancouver, BC (Catholic Register) – Four hundred years after he was killed with an axe while trying to unify the Catholic and Orthodox Churches, St. Josaphat’s goal of church unity remains as important as ever, say priests of the religious order that resulted from his reforms. Today St. Josaphat is known as a martyr for unity and his goal of reconciliation between the two churches is still badly needed, Fr. Joseph Pidskalny, OSBM, told a celebration last month at St. Mary’s Ukrainian Catholic Church. The event marked 400 years since the founding of the Basilian Order of St. Josaphat. “Whether we be Eastern-rite Catholics or Roman Catholic, or something else, if we could be unified in our lives and in our praise of the Lord, we can become stronger, both as an individual and as the Church,” said Pidskalny, the superior of the attached Basilian monastery at St. Mary’s. The 400th anniversary of the order is the perfect time to renew that mission, said Pidskalny. 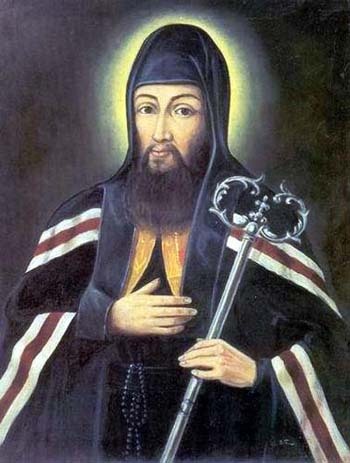 St. Josaphat Kuncevic was born in 1580 in what is modern-day Ukraine, where he was baptized into the Eastern Orthodox Church. His religious piety and drive for Christian union soon found him directed toward the monasteries of the area, where, alongside Metropolitan Joseph Benjamin Rutsky, he joined the Order of St. Basil the Great. “St. Josaphat himself was (Eastern) Orthodox so when he entered the Order of St. Basil the Great, he was entering a Catholic order,” said Pidskalny. “For him, unity was very important because he understood we as Christians should be one. The divisions between Orthodox and Catholic were deep and St. Josaphat had opponents in both camps for his unification efforts. In November 1623, he was killed with an axe by a mob in his archdiocese of Vitebsk. Pope Pius IX declared him a saint in 1867. Haber brought with him relics of the saint — a finger bone of St. Josaphat as well as a scrap of his clothing. “We were wondering how we could celebrate our 400th year here in Canada,” he said. The relics were proposed as an idea to allow attendees of the celebration to be physically closer to the saint and understand his message. St. Josaphat “did so much to try to bring the Orthodox and Catholic Churches together,” said Pidskalny. The anniversary offered the order a chance for “renewal,” added Haber. "Religion and Nationality in Western Ukraine: The Greek Catholic Church "
Or example on page 31: “…Papal gesture of moral support for the insurgent Poles.” Page 31 And he writes that the Polish priests distributed thousands of portraits of Iosaphat during the Polish insurrection of 1863 against the Russian Empire. Much later it was the Ukrainian Catholic Basilians who promoted Iosaphat as a Uniate hero. Why would the Catholic Register during Lent publish such an anti-Orthodox article? The Poles created the cursed Unia. It came back to bite them in the rear, when so many Ukrainian Catholic Nationalists sided with the Nazis. My ancestors in Eastern Ukraine threw off that cursed yoke.